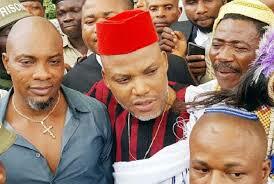 We the Indigenous People of Biafra (IPOB) worldwide do hereby raise alarm over the incessant raids on our leader's compound in Afaraukwu Umuahia by the Nigerian Government and her security operatives especially the Nigerian army and police, who have been stealing and looting the palace of His Royal Majesty Eze Sir Israel Kanu for weeks now. They have left a trail of destruction and continue to cause undue panic amongst the inhabitants of the village. The criminal activities of these thieves in uniform were captured on hidden CCTV cameras mounted in and around the compound. Those responsible for the vandalisation of Kanu's home were initially not aware that they are being recorded until the footage started appearing online. On realising they were captured on camera they returned to the palace to destroy the CCTV cameras and loot yet more properties. It was at this point the Nigerian Army acknowledged for the first time that they have frequently conducted raids on the palace like lawless bandits. It should be noted that Nigerian Army had from inception denied any knowledge of their soldiers raiding the home of our leader. This incident is a glaring example and confirmation that Nigerian army, the APC government of Buhari, Igbo governors and Nnia Nwodo led Ohaneze Ndigbo have been lying and deceiving the public with their perfectly crafted lies. An army that specialises in stealing and looting the homes of civilians and when caught reversed their position to that of searching for arms cannot and should not be taken seriously by any organisation or body in the world. The Nigerian Army and their accomplices i.e. Igbo governors and Ohaneze Ndigbo leadership have a well rehearsed narrative synchronised to frighten the people into believing the falsehood that IPOB was involved in violent agitation when they know same to be a pack of lies. The murderous Nigerian solders arrived with 15 Hilux vans to our leader's compound for the second time in a space of 24 hours and stayed for up to 5 hours inside the compound packing private properties belonging to our leader Mazi Nnamdi Kanu, his wife's clothing and jewelry and other items belonging to the rest of his family members. Could Nnia Nwodo along with South East governors have clearly envisage the brazen daylight robbery of Nigerian soldiers when out of envy they requested Buratai march his Islamic Army under the cover of Operation Python Dance II to Isiama Afaraukwu Ibeku and across Biafraland. We must also point out to the world that those kidnapped during the murderous invasion of our leaders compound that led to the death of 28 people on the 14th September 2017 are still unaccounted for, including our Mazi Nnamdi Kanu himself. There is no doubt in our mind that our leader, alive or dead, is in the custody of the Nigerian Army with the knowledge of Igbo governors and Ohaneze Ndigbo. All denials by the Nigerian Army should be weighed against their background of well documented lies and deception. The Nigeria Army, like their Ministry of Information, is incapable of telling the truth at any given situation. They denied having raided the compound of our leader only to turn around and accept they looted properties when they saw themselves on CCTV video footage stealing. Had their criminality not been captured on CCTV, they would have gone on to deny it as usual with the help of their media allies. Concealing the truth is what they are good at. The world must know that this same Nigerian army who were caught planting bombs and other explosive devices in our leader's compound, will return at a later date to say they located a bomb factory in the premises. Fabricating and manufacturing lies easily peddled by their sympathisers in the media is the way they operate. They also have corrupt judges like Justice John Tsoho, Justice Kafarati and Justice Abang to grant them whatever judicial relief they seek in order to give the full backing of the law to their lawlessness. This shameful scenario is playing out in the full view of a country that wants to be regarded as civilised and democratic. The continuous robbery attack meted on the people of Isiama Afara Ukwu Ibeku particularly to our leader Mazi Nnamdi Kanu and his family members by the Nigerian army and police has become unbearable to the people of Biafra and to all men and women of good conscience must rise to condemn it. We are still wondering why and what the Nigerian army and police holds in mind before embarking on this yet another invasion and attack on our leader's compound on Sunday 8th October 2017. We are advising the community of Afara Ukwu to be weary on how to move around the community especially the compound of our leader Mazi Nnamdi Kanu because the army and police might have planted explosives in all strategic places within the palace. 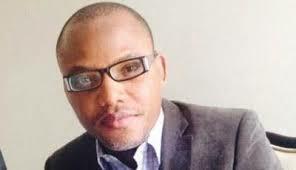 It is very important to note that the Nigerian army denied ever been to or invaded Nnamdi Kanu's compound on the 14th September 2017 but this latest robbery Incident have proved beyond every doubt to the whole world that they invaded our leader's compound despite all their denials and bare faced lies. We are calling on the community of civilised nations, human rights groups and other conscientious global organisations to prevail on this APC Nigerian government to account for the properties they stole from Mazi Nnamdi Kanu's family home and to openly tell the whole world what type of bombs and explosives they planted in his compound. They must also stop lying and produce our leader and all those arrested during the murderous raid of 14th September 2017.